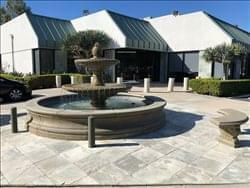 Find My Workspace lists over 95% of the executive office suites market in Irvine. Simply click Request Quote to check pricing for one office, or Add to Basket for multiple offices. 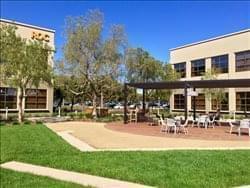 This space is a three-acre technology campus in Irvine, California consisting of both commercial/co-working spaces and tech and creative companies. The building boasts a beautiful outdoor area, “The Park”, and a great indoor space called “The Atrium”, which houses our on-site cafe and weekly events. Within the building you will find a co-working space designed for startups and entrepreneurs. Three different types of memberships are on offer in addition to private units called Office PODS. General membership is $299/month and includes a simple desk. Dedicated membership is $499/month and includes a desk + storage space that specifically assigned to you. Office PODS are designed for teams and are private offices within the HUB. Pricing on these spaces varies. 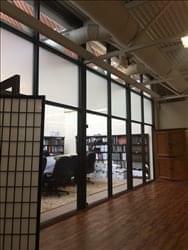 This exquisitely furnished business center is a creative community-based working environment offering an extensive range of specialist workspace solution packages including premium private offices, co-working, dedicated desks, virtual offices, conference rooms, indoor/outdoor event space, and more! In collaboration with EvoNexus, the Irvine , and UC Irvine, this center is proud to introduce a space for brainstorming, mind mapping and creating the products of tomorrow! Indoor/outdoor work areas, weekly events, and farmers market are only the start of what will be the epicenter of innovation in OC! Irvine Spectrum Center is filled with more than 130 specialty stores, restaurants, and entertainment venues, putting you in the middle of the action. You’ll enjoy panoramic views of Orange County, immediate access to freeways and nearby green spaces. Our members at 100 Spectrum Center Drive, in Irvine, CA have a wide array of rental office space options to choose from, including private executive offices, spacious office suites, and flexible co-working desk options. Great virtual office packages which include a prestigious mailing address and phone reception services are also available. The building was rebuilt back in 2008 to provide modernly designed offices and conference rooms, suites offering fast move-in, limited disruption, and flexible leasing terms for growing and established businesses including daily-offices. Private fully furnished office accommodates 2 – 5 people depending on furniture arrangement. Prestigious address with central location makes commuting easy with effortless access to the 55 and 405 Freeways, the 73 Toll Road, MacArthur Boulevard and Main Street. This center is a large industrial building which includes large offices, co-working spaces, conference room, restrooms, large greenbelt and walking space in the back. The building is located closely to large shopping center with a wide variety of lunch options. The center has a quiet environment and is also pet friendly, has great staff, where everyone is young and able. The building also provides lots of available parking. This center, located on Van Karman Avenue, is a creative coworking space that helps to inspire innovative thinking among like-minded entrepreneurs. The original interior design offers a chic work environment where you are a member of a dynamic community with a diverse business community. The space has beautiful outdoor areas around the complex, perfect for inspiring creativity in the fresh California air. To obtain information for your selected Irvine Executive Office Suites, please tick the "Add to basket" box for each office you prefer and complete the form below. We will then send a detailed report via email.